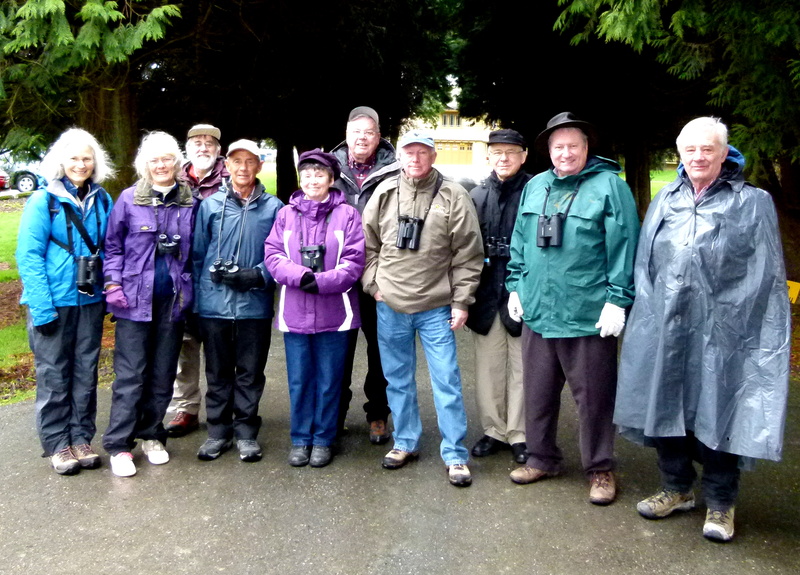 Nine brave souls (Lorna, Hans-Ulf, Gerhard, Roger, Mike B, John MacF, Bryan & Janet and returnee Valerie) joined me on a cold, windy, rainy Monday morning to Alaksen Wildlife Management Area (WMA) and Reifel Bird Sanctuary. Hi-lites were: Sawhet and Barred Owls, Red-throated Loons and Lorna’s tasty cakes. See photos of the outing on our DNCB Picasa site at http://picasaweb.google.com/dncbirding. Because of the weather we “car-birded” through the Tsawwassen First Nations and the Ladner farm fields toward Westham Island. Not much seen, but the conversation was riveting; I chatted for a long time with Gerhard until I finally realized he was in the vehicle behind. A few Trumpeter Swans and Northern Harriers in the fields. We stopped at the Fraser River small parking lot beside Canoe Pass. Among the white-caps in the fast-flowing river, we caught glimpses of both Common and Red-breasted Mergansers and Western Grebes. Interestingly, we also saw three Loon species; Red-throated, Common, and Roger thought one of the Loons diving close to shore was a Pacific. It was too cold to hang around for longer looks. A flock of a few hundred Snow Geese was in a field near the Reifel entrance. At the Alaksen parking lot, we met Masaaki Kawabata and his two friends who showed us the Barred Owl in the conifers (same tree where we saw the pair last week). Then he took one of our obligatory Group Photos. While we were examining some fresh Pileated Woodpecker holes, a Cooper’s Hawk flew by. Most did not see it, nor did we see the Barn Owl fly-past, or the Great-Horned Owl behind the barn, or the singing Bewick’s Wrens, or the Common Redpolls, or the very loud distinctive Hutton’s Vireo. I felt like I was leading a group from the CNIB. 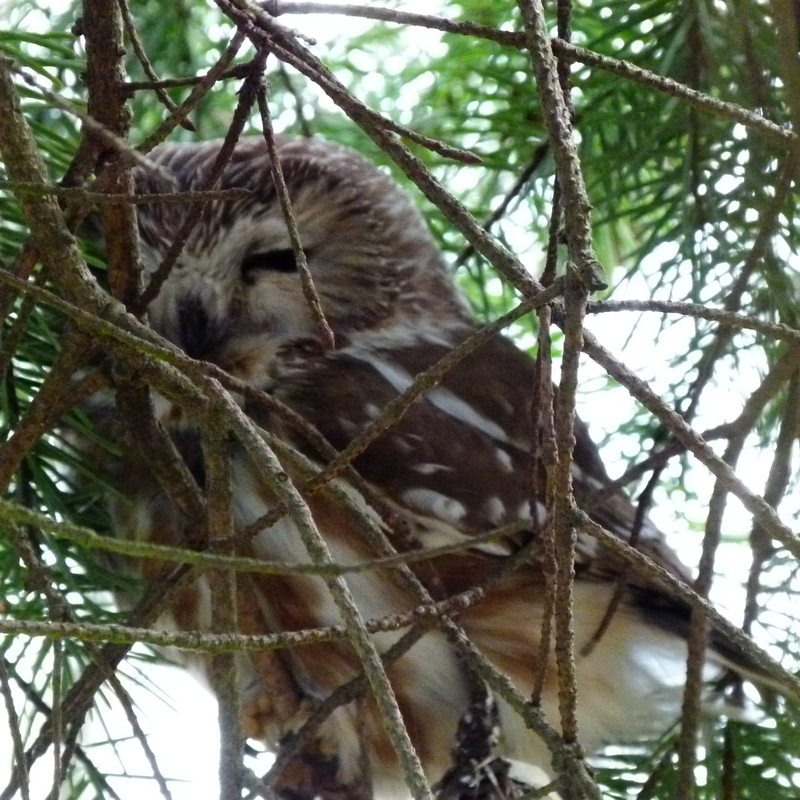 We did see one of our target birds, the Saw-whet Owl that has been there for a few weeks. And Lorna was pleased when a Belted Kingfisher flew across the water. On the other South arm of the Fraser we saw more Red-throated Loons and Mergansers. Following a delicious Smoko of Lorna’s home-made black cake, and a chat with regular DNCBer Eleanor and her two guests from Deep River, Ontario, we drove next door to Reifel. A Ring-necked Pheasant was wandering in the grass beside the driveway. Laura, along with the three resident Sandhill Cranes welcomed us at the entrance. Reifel was, as usual, very accommodating with its up-close-and-personal looks at numerous waterfowl species. 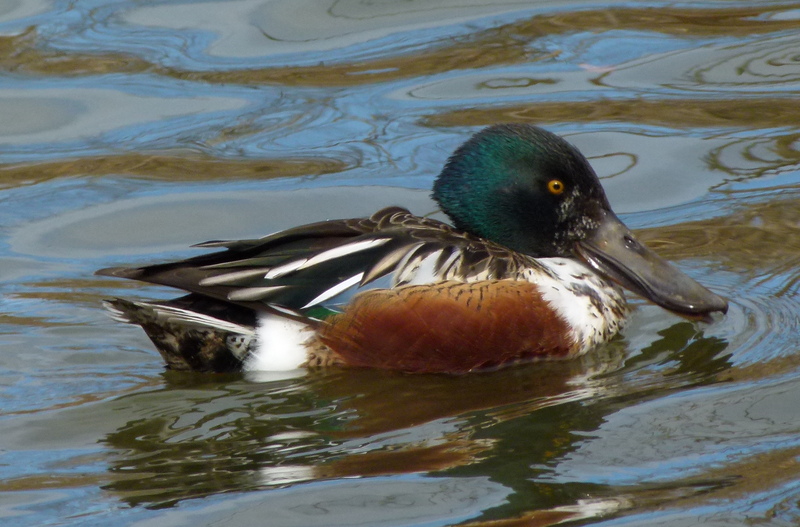 In the ponds we saw; Northern Shovelers, Northern Pintails, beautiful Hooded Mergansers and Wood Ducks, Bufflehead, Lesser and a few Greater Scaup, Gadwall, Mallards and American Wigeon. We missed the Canvasback and Ring-necked Ducks. 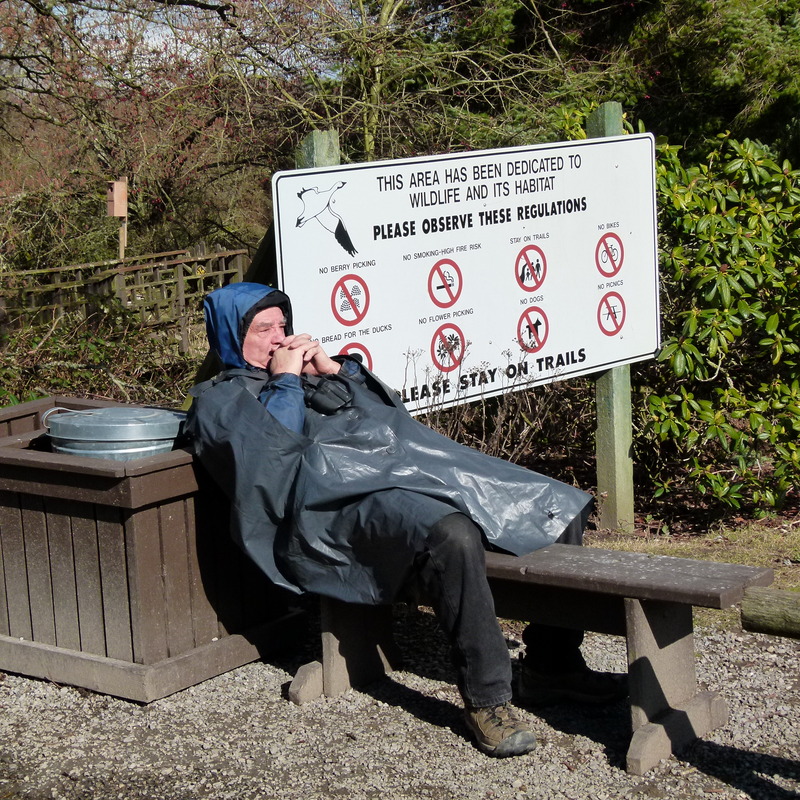 The weather changed while we were at Reifel and got sunny and warmer, so some of us climbed the Tower, except for Gerhard who was so exhausted from the riveting conversation, he fell asleep on a bench. Over the white caps on the Strait of Georgia and we saw a small flock of Shorebirds, likely Dunlin. A few Swans in the Marsh. I don’t mention Bald Eagles much anymore because there are so many around. On the way back to Petra’s we stopped at the horse farm on 28th Ave where the Rough-legged Hawk hovered characteristically for us. Another typically enjoyable morning of casual birding. Next Monday, March 12, DNCBer’s will do a “Bird Identification” outing at Burns Bog. We will meet Jeremy of the Burns Bog Conservation Society in the parking lot behind GPF Arena (entrance to Burns Bog) at 8:30 a.m. Some will meet at 8:00 a.m. at Petra’s to car-pool to the Bog. Don’t forget our Delta Nature monthly meeting on that same Monday evening at 7:30 p.m. at Cammidge House. Larry Cowan will speak on his recent birding adventures in Ecuador. 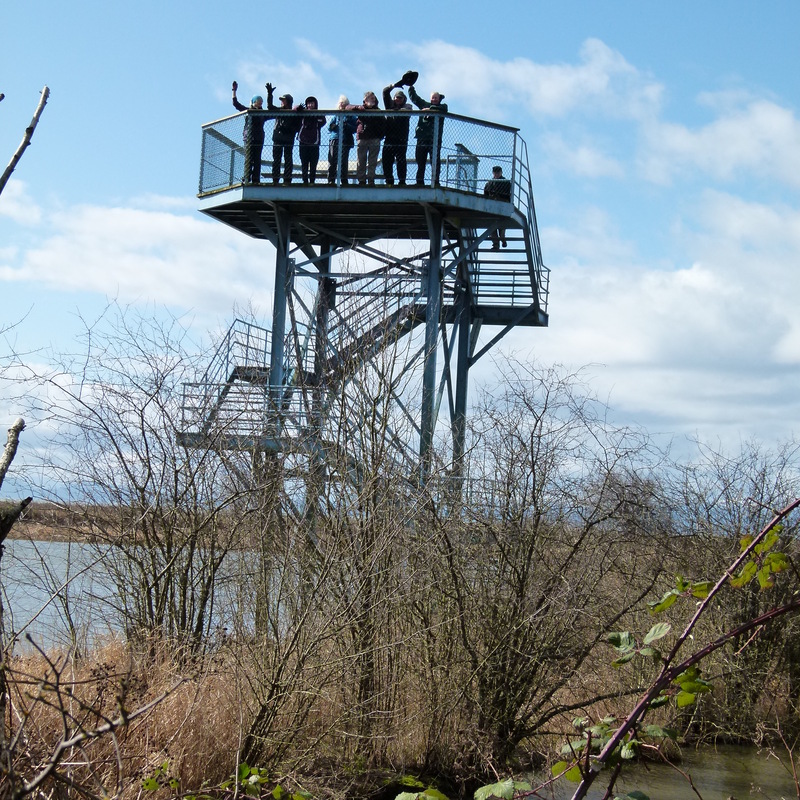 And next Wednesday, March 14, is our quarterly Birds on the Bay outing in Boundary Bay Regional Park. We meet at Cammidge House, 9:00 a.m. departure on the 2 ½ hour walk, followed with “goodies” provided by the Delta Nats ladies. Comments welcome, indeed encouraged, check out our DNCB Blog at https://dncb.wordpress.com, and please tell me if you don’t want to receive these annoying missives. At the end…a big bill! 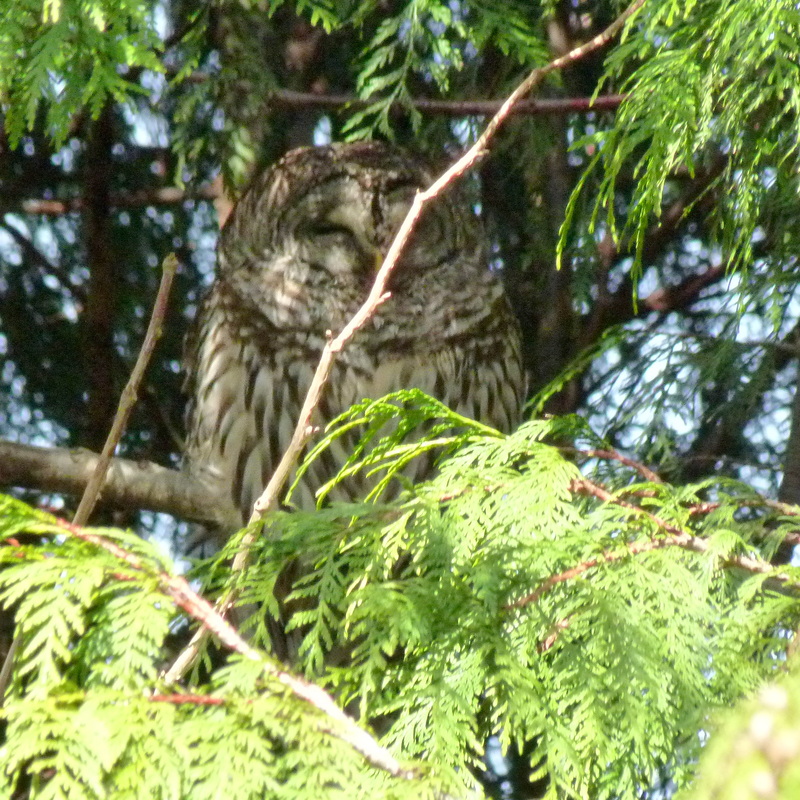 This entry was posted in *DNCB, Alaksen NWA, Barn Owl, Barred Owl, Great Horned Owl, Northern Saw-whet Owl, Reifel, TFN. Bookmark the permalink.